The list of top ice dancers in the world wouldn’t be complete without the name of French ice dancer Gabriella Papadakis and her partner, Guillaume Cizeron on it. Papadakis is one hot and skilled dancer who has won several tournaments and championships including the World Figure Skating Championships (three times), The European Figure Skating Championships (four times), The French Figure Skating Championships (four times), and the 2017 Grand Prix Final (GPF). Gabriella Papadakis is also a 2018 Olympic silver medalist and together with her partner Guillaume Cizeron, they have won 5 gold medals on the Grand Prix series. They also won silver medals at the 2012 Junior Grand Prix Final and the 2013 World Junior Championships held in Milan, Italy that year. Papadakis and Cizeron are experts at short dances, combined total and free dance. Below are other facts you probably didn’t know about the French ice dancer. Papadakis was born in Clermont-Ferrand, France on the tenth day of May 1995 to Catherine and Emmanuel Papadakis. Her mother is a skating coach and her dad owns a food truck in Austin, Texas. Her father is from Korydallos, Greece; his family’s roots can be traced to Crete. Gabriella moved to Montreal, Quebec, Canada, 2014 after she turned nineteen. Papadakis and her skating/dance partner Guillaume Cizeron have been a pair since they were about nine/ten years old. The two kids were both members of a skating club in Clermont-Ferrand when Catherine (Gabriella’s mom) noticed that they would do well together as a team as their styles and size matched perfectly. She encouraged them and began training them as a pair until they made their first appearance at the 2009/10, ISU Junior Grand Prix series, taking the fifteenth place. They also took part at the 2010 World Junior Championships, finishing at the 22nd position. The pair relocated to Lyon in 2012 and boasted an impressive resume of coaching experience. Together, they have won 5 gold medals on the Grand Prix series. They have also won silver medals at the 2012 Junior Grand Prix Final and the 2013 World Junior Championships held in Milan, Italy. 2017 was a good year for the Franch dancers as they became the first ice dancers to break the 200-point barrier, to earn the ISU Grand Audi Cup of China. They had to pull out of the 2018 NHK Trophy due to an injury Cizeron sustained on his back, they, however, competed at the 2018 Internationaux de France where they set new world records in both programs and overall and won the gold medal. The beautiful ice dancer suffered a concussion in 2015 after falling during a practice. Due to the concussion, the pair suffered a major setback that year as she was away for several weeks, leaving Cizeron to practice alone. The injury also led to the duo pulling out of the Master’s de Patinage scheduled for the second week of October and from both the Trophée Éric Bompard and the NHK Trophy that year as the doctors were not sure how long her recovery process would take. Gabriella Papadakis was back on her feet by December and with her partner, they won their second national title. Although it could be very embarrassing, a wardrobe malfunction is very common in entertainment, especially in sports such as ice dancing and the pretty dancer had her share of the embarrassing moment at the Short Program at PyeongChang, South Korea. It was early in their performance when the top of Papadakis’ dress came unfastened, she managed to skate through it, but towards the end of the performance, the dress went up when she threw herself backwards, thus, leaving her entire body exposed and on camera. The malfunction also affected their score at the competition, leaving them in the 2nd place behind Tessa Virtue and Scott Moir. With the chemistry, they (Gabriella Papadakis and Guillaume Cizeron) both share on stage, many have concluded that the pair must definitely be an item in real life; if you are from that school of thought, we are sorry to shock you but the two are nothing more than just partners. In fact, they consider themselves more like siblings. 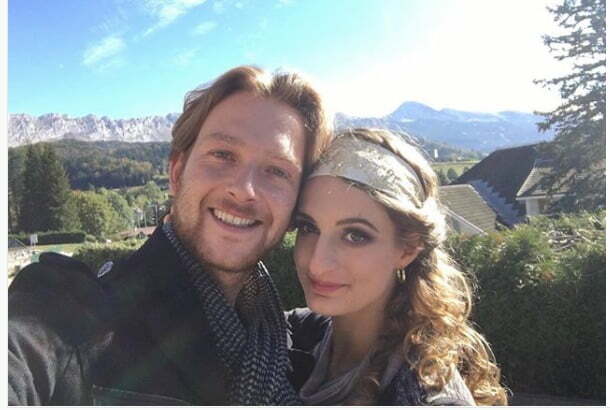 Papadakis is currently dating German/ Italian ice skater, Stefano Caruso.